There are few things better than Chicago Summers. From a cityscape drenched in sunlight to endless local flowers in bloom- it is this time of year that Carly and Andrew started their married life together surrounded by beauty. 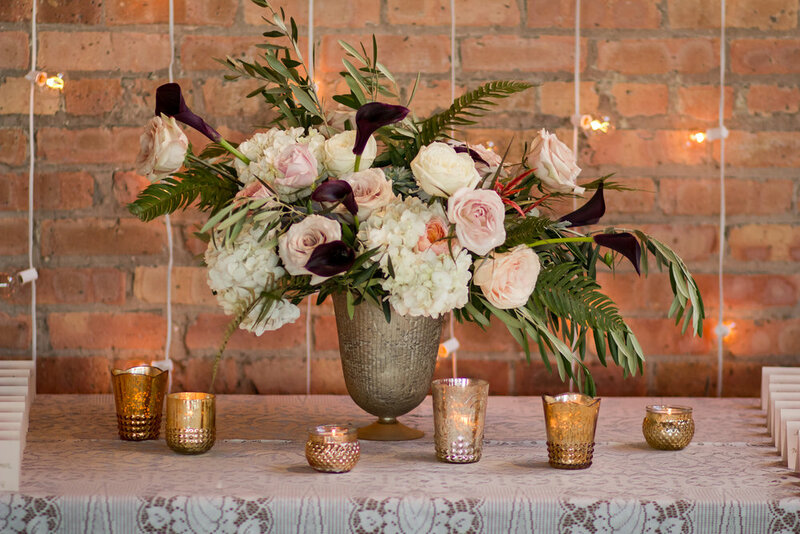 They chose Bridgeport Skyline Loft as their venue, with its rustic brick and wooden beams and a wall of windows overlooking the majestic Chicago skyline. Their ceremony decor was one of our all time favorites! A super lush green arbor (made of birch, roses, seeded eucalyptus, olive foliage and vines) framed the couple while clusters of candles and rose petals lined the aisle. Fun fact: we repurposed the garland on the arbor on the head table (minus the wild vines). 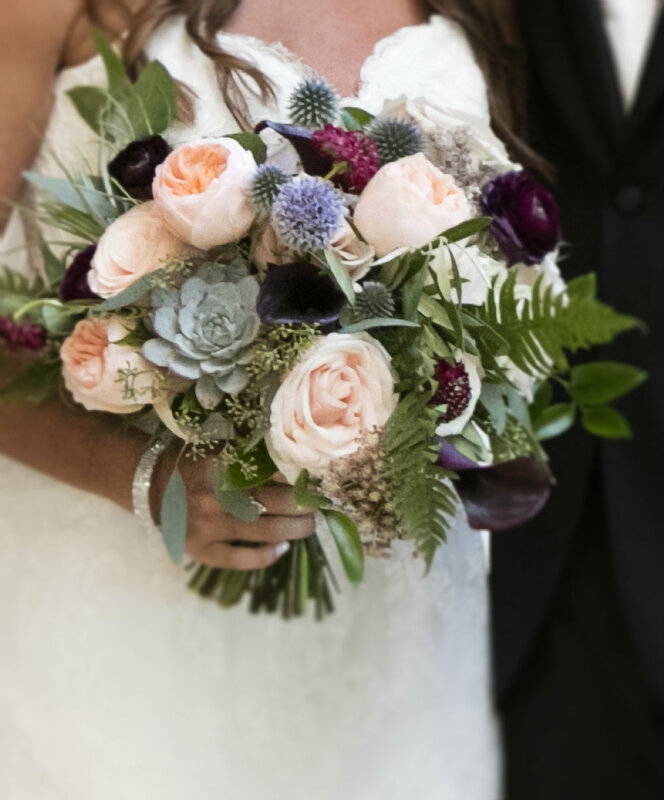 Carly held a bouquet with air plants, succulents, thistle, ferns, antique colored roses , Juliet peach garden roses and pops of burgundy ranunculus and dark purple callas. So much yummy texture! Andrew and his groomsmen wore petite succulents with burgundy ranunculus boutonnieres to accent the pop of color in the ladies bouquets. Their centerpieces were equally textured with the addition of hydrangea in gold compotes and tall stemmed candles with gold votives inside. Special thank you to Jason W. Kaumeyer for capturing and sharing these details so beautifully. We should also give a shout out to Art of Imagination for the most stunning drapery and chandeliers!